Mansfield, Nottinghamshire. 26th July, 1934. Bradshaw and Caudwell and two or three others returned to the loader gate near the intake airway and waited for the arrival of the first Rescue Brigade. While they were waiting, Bradshaw, with the full approval of the others, decided that the ventilation screen in the loader gate should be taken out and erected in the intake air way and this was done. They thought that this would cut off the air from the fire and ensure fresh air along the right bank and down the return air way where he understood, men were still travelling to the bottom of the shaft. Wheatcroft, the overman and Mr. Holmes the Undermanager both knew that this had been done and it was to have important repercussions. 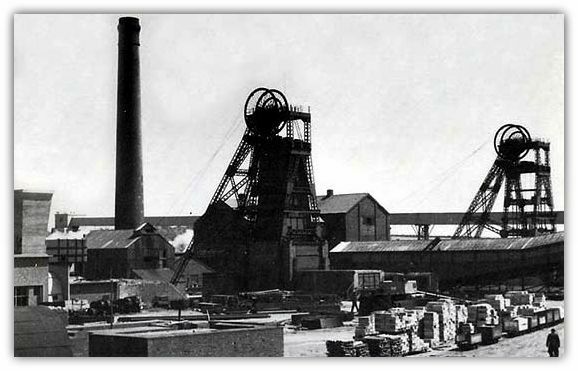 The Mansfield Rescue Brigade was the first to arrive and reached the colliery at 6.57 p.m., changed into their apparatus and descended at 7 p.m. arriving at the junction of the loader gate and the intake airway at 7.30 p.m. this was thirty five minutes after the position of the screen had been changed. The man in charge of the Brigade, Francis Bates, met Bradshaw and the overman, who explained the position. They did not know that there was fire and did not have extinguishers with them. Their chief concern had been to get underground as soon as possible to rescue any one who may still be in the explosion area. Frank Pemberton returned with the canaries and the Brigade had brought him an apparatus. He then assumed control of the situation. The Brigade established a base near the face and wearing apparatus, they examined the left bank. They found a fire in the first waste of burning coal and timber on the floor, burning red but not giving off much smoke. Some clothes were found that had been on fire and had been put out with the water from bottles that were hanging nearby. The Rescue man tried to put the fire out with what stone dust and sand was available but they could not quite reach the seat of the fire. They used some of the ripping dirt to build a barrier to prevent the fire extending towards the coal face. Bates handed a safety lamp to Pemberton who tested for gas at the first wood chock. He and Mallinder saw the gas "go right up into the gauze" and the men were withdrawn to the telephone beyond the loading point where they waited half an hour for the arrival of the second Rescue Team. Mr. Holmes had gone to help organise supplies of dust to go to the face and a barrel of water to replenish the extinguishers which had been sent for. 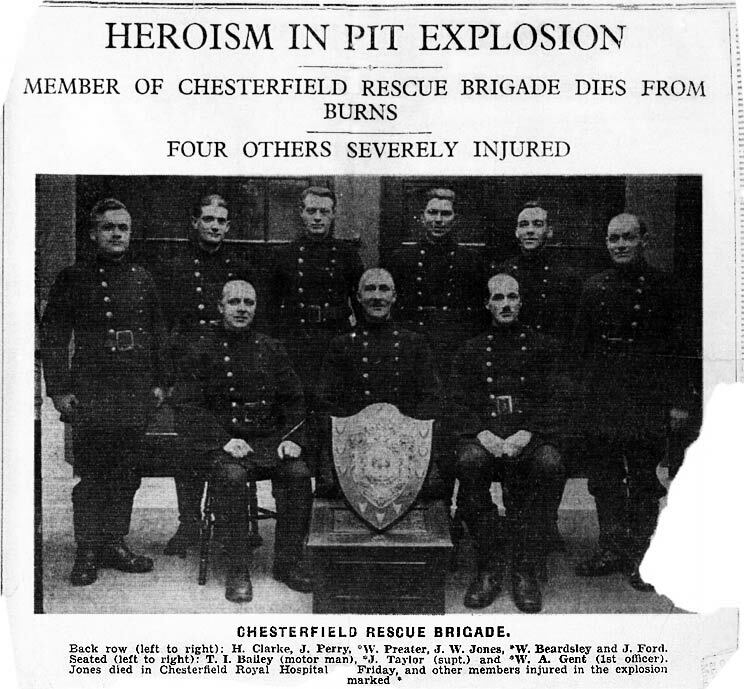 The men of the Chesterfield Brigade went forward with the fire extinguishers to deal with the fire and stone dust was being applied along the loader gate to check any secondary explosion which might occur. Mr. Taylor followed them in and asked the Mansfield men to stand by to give assistance. On finding the air clear he moved the base to within ten yards of the ripping lip and arranged for workmen to take positions behind so that they could pass extinguishers and buckets of stone dust to those at the face. W.A. Gent, the captain of the Chesterfield Brigade with William Preater, John William Jones and William Beardsley went to tackle the fire which according to Wilcock of the Mansfield Brigade had got worse. They had some difficulty in directing the extinguishers directly at the fire but the flame was subdued and William Preater and John William Jones thought it was almost mastered when it flared up again. While this was going on Beardsley tested for gas in the bank near the first chock. He found four and a half percent and pointed this out to Gent. Beardsley and Gent relieved Preater and Jones and Mr. Taylor went to the gate-end and asked the position. At this time smoke was seen coming from the pack through a roof break into the loader gate. He fell between the belt run and the gate side and remained there for some time and when all was quiet he made his way out along the belt in the dark until he reached the telephones. The men got on the belt and made their way out picking up an electric light which was still burning and they went to the pit bottom. All these men were burned and Woodcock later died. At the fresh air base Superintendent Taylor was burned about the face, he gave oxygen to men as they passed. Alfred Selby and one or two others went in search of any missing men. After about 50 yards he found Gent and 80 yards further up, Preater and Jones were found badly burnt. Jones had to assisted out but Preater managed to walk to Mr. Brown, the Rescue Station Manager, who removed his apparatus and covered him up. Jones and Preater were carried out on stretchers and taken to Chesterfield Hospital where they later died. Beardsley was still missing and Mr. Taylor went back to the base to seek help. The party got to the gate end and were enlarging the hole over the fall when Beardsley, who had a light and breathing apparatus, came out of the right bank to the loader gate where he collapsed. In his anxiety to get out after the explosion his electric lamp had gone out and he had missed the gate and gone into the right bank. He was badly burned and was taken to Chesterfield Hospital and made a good recovery. He was well enough to give evidence at the inquiry. The manager had informed Mr. J.R. Felton, H.M. Divisional Inspector of Mines, shortly after 8 p.m., that all the men were out and that seven had been sent to hospital and the rest sent home. Mr. T.E. Pickering, the Junior Inspector, and Mr. A.H. Steele, the Senior Inspector, went to the pit and were informed that a wood chock was on fire but the Rescue Brigades had the situation in hand and the fire was almost out. At about 10 p.m. Mr. Felton received a telephone message that a second explosion had occurred and he went to the colliery at once. With all the men out and the fire still not out it was decided to seal off the North West No.6 district by erecting a stopping in the main intake 300 yards from the face and in the return if possible. These two stoppings were made of brattice cloth backed by sand and these were closed simultaneously at 5.30 a.m. on the 27th July and then strengthened. About three hours later Mr. Brown reported that the return air was full of firedamp and it was considered unwise to continue the work and it was decided to erect another stopping in the North West No.3 return road, near the North West main return. On the morning of 28th July this area was sealed off by men wearing breathing apparatus. During the work thirteen or fourteen explosions were heard behind the stoppings, the first of the 27th July and the last at 12.10 a.m. on the 30th July. There were two explosions at the colliery, one shortly after 6 p.m. which injured eighteen people, six of whom died from their injuries and this was followed three hours later by a second which injured twenty two, three of whom later died.